Fashion bible Vogue, has faced numerous criticism about its lack of diversity. When the publication posted a picture of its all white in house team a few years ago, people were not impressed. Further to the all white team, Vogue has been under scrutiny for the lack of women of colour who grace the monthly issue. 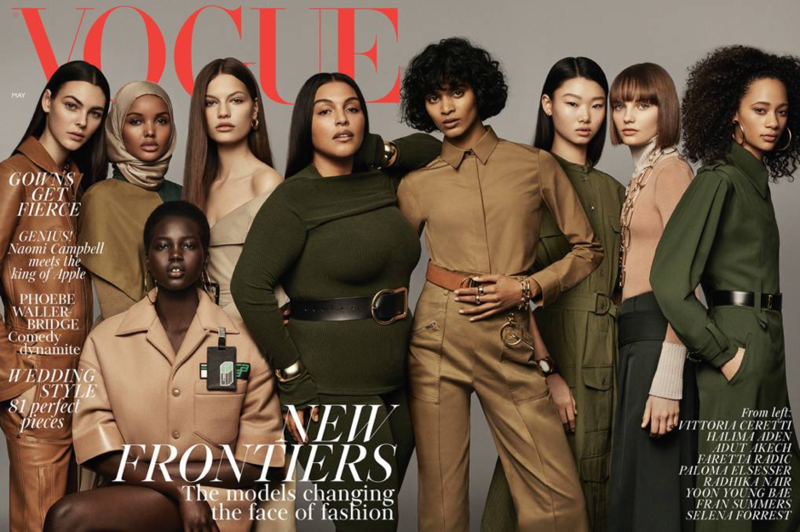 In an article about the May cover, Editor-in-Chief Edward Enninful said that “it is a moment for Vogue to do what it has always done best: to offer a bold vision of what the future can- and should look like.” As a result, he wanted the May cover to capture nine future model superstars to show everything that Vogue stands for in 2018. The editor admits that 10 or 20 years ago a Vogue Cover would never feature the nine women selected. The cover therefore shows a much needed change in the fashion industry and that the magazine is finally embracing diversity and thus a more realistic representation of society and the world. Enninful describes diversity as “across the board”, this means it is not limited to black and white. With this cover he wants to celebrate true diversity which includes religion, sexuality, size and socio- economic background. Halima Aden – Halima Aden is the first model to wear a hijab on the cover of Vogue. She is famous for refusing to conform to fashions standards. The model was born to Somali parents in a refugee camp. At the age of seven she moved to the United States. In the US she would later be scouted by a modelling agent after entering a beauty pageant. Since she has walked in high fashion shows including Yeezy Season 5 and MazMara. Adut Akech – Adut Akech is a South Sudanese model who walked in every major catwalk in the last fashion week. She made her European catwalk debut at a Saint Laurent show. After her walk for Saint Laurent the model says her career took off. Fran Summers – Fran summers is a Yorkshire model. So impressed with her look, she was signed to Storm modelling agency.